The Open Call Fresh Legs for 2019 is now closed you can apply from November 1.th 2019 for our next Open Call in 2020! 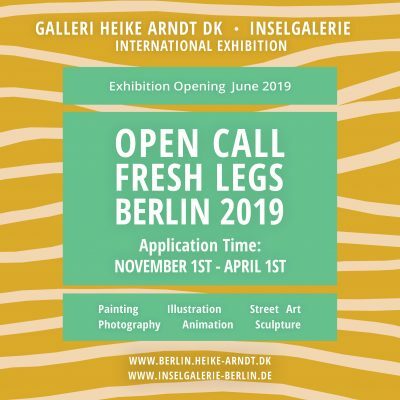 “Fresh Legs” is our most recent exhibition initiative, with which we would like to present art forms such as painting, illustration, drawing, street art, photography, short film, animation and related media. (NO GRAPHIC/NO MULTIPLE EXCEPT PHOTOGRAPHY) Together with our new cooperation partner, the Inselgalerie Berlin, we create this year,a platform for the public to meet each other and to discuss the art of these fields together. Thus, we offer a place to exhibit and inspire the artists who are still unknown and the already established ones. The Inselgalerie exhibits solely the works of female artists the 190 square meter gallery, whether it is painting, sculpture or crossover techniques. It has existed since 1995 and, with this coherent program, is the only one of its kind in Berlin. The “Fresh Legs” exhibitions have been of great success since 2013. What is common between the artists is the discussion of humanity and our current way of living, and the reflection of it through completely different media and techniques. Several of the artists will be selectet from this exhibition for the great opportunity to be shown also in Denmark in the fall. Only if you are accepted for the exhibition (which means being chosen in the screening process and being asked in writing by our curatorial staff to send us your work) please send us your works in a secure packaging to the following address. Also, please include a Work description in the package, both on the backside and on a separate printed document. We do not take any responsibility for unsolicited works that have been sent to us! If the works have been selected for the exhibition, the artist alone is responsible for packaging, sending to and from the gallery and taking care of the shipping insurance. The selected works must remain in our disposition for 12 months, so that we are able to implement them in the following exhibitions. Please notice that all works need to be for sale. There will be a one-time exhibition fee of 38 Euros for the selected artists to cover the costs of printing materials, flyers and posters. In the event of selling an artwork, the gallery takes a service fee of 30-50 % of the sales price, depending on the material. The service fee includes the prevalent VAT. Please be aware that the gallery holds no responsibility for any damage or loss that may occur to the works during transit, installation or exhibition. We would, however, like to draw your attention to the fact that we handle the prints with extreme caution and have not had any damages in 25 years’ time handling art pieces. If you have uploaded the application form successfully, you will receive a mail in about 2-5 minutes after the submission!